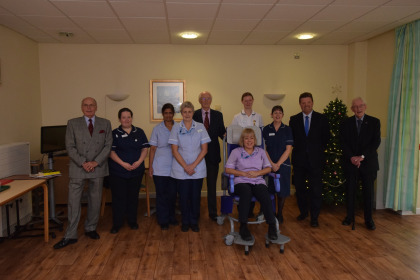 A local community group has given Leamington Spa Hospital’s stroke ward a specialist shower chair for patients. The Provincial Grand Chapter of Warwickshire Benevolent Fund donated £4,300 for a new Carino shower chair for Feldon Ward at Leamington Spa Hospital. The height-adjustable chair will benefit patient’s suffering from a stroke that have limited mobility. A member of the Chapter, John Durling, asked the group to consider making the grant after the ward cared for his late wife, Heather Ann Durling. The shower chair enables patients to retain more dignity during washing and ensures excellent hygiene. SWFT Charity supports and enhances local hospitals and community services across South Warwickshire. To learn more about fundraising for SWFT Charity, contact 01926 495321 ext. 6996 or email charity@swft.nhs.uk.